Double bed with upholstered and padded headboard. The four poster bed as well as the other furniture is realized with hardwood and the carved lines follow the Classic floral patterns. Each carve is covered by gold leaf applications and the pieces can be tailormade and accessorized in order to satisfy the most demanding request. Everything is handmade by skillful Italian handcrafts. 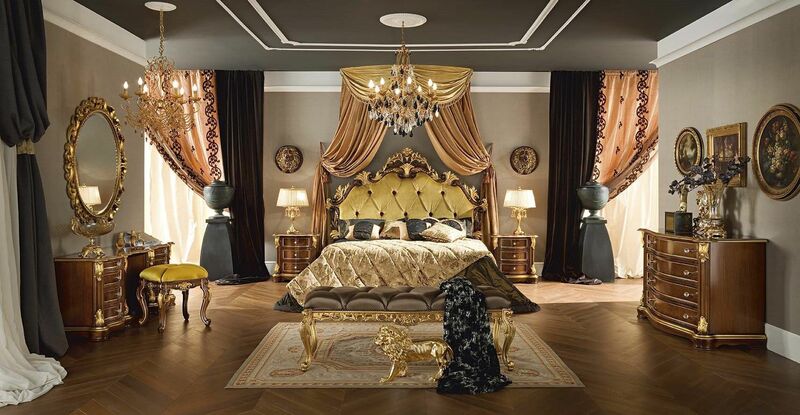 The luxury bedroom is ready for guarantee the best sweet dreams ever.